Blue Heaven Non Transfer Lipstick – 711 Brown Twig, Review & Swatches. Blue Heaven is an Indian makeup brand which recently launched another line of lipstick called Blue Heaven Non Transfer Lipstick which has total of 18 beautiful shades. Also available in their own site and Amazon. It comes in a form of bullet lipstick but has a appearance of crayon lipstick . The outer covering made of plastic , is in black in colour and is retractable . The cap in transparent. The good thing is the total lipstick gets inside or else if the head of the lipstick was out it would mess with the cap. The shape of the lipstick is slanted which is easier to apply lipstick. You can line and upper lips easily. However Every Time I need time with the lower lip. Firstly , it is something different. 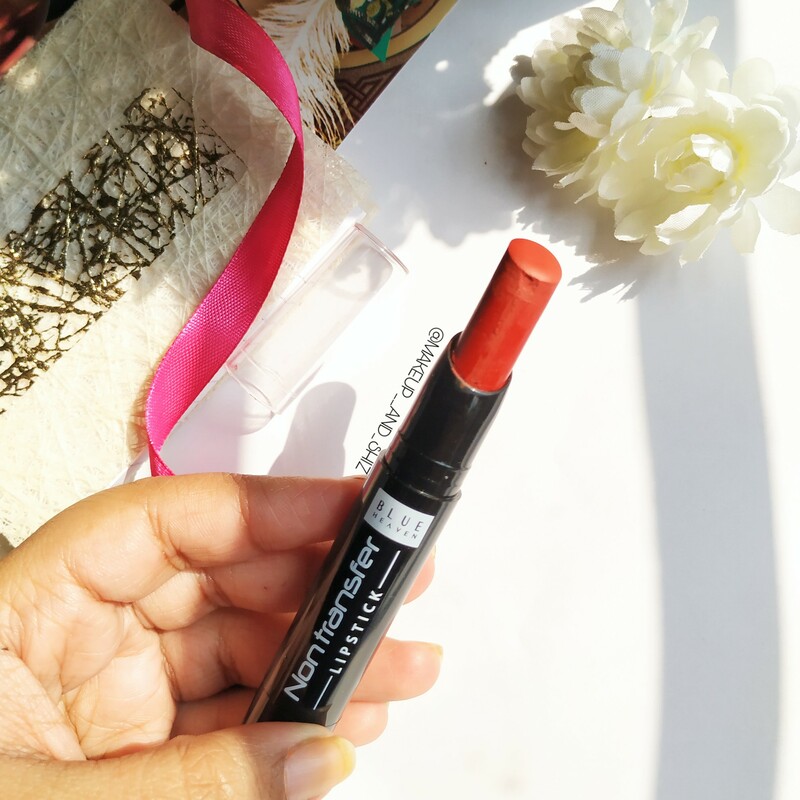 It doesn’t have that creamy texture when I apply on lips but yet glides on to lips smoothly! ( I scrub my lips once a week and apply lip balm everyday) It might be hard to apply if your lips are not prepared ( Scrubbed and moisturized) . You can reapply another layer and it won’t crumble. It stays for good amount of 8 hours at least ( I kept it for 8 long hours after which I removed it myself ). It stays put on your lips when you randomly munch foods and or you might drink. Only when you eat oily food , it fades a little from the center but a tint of the lip shade remains. Brown Twig is a beautiful brownish red shade which will suit all Indian skin colour. It’s a brick red colour with brown undertones. Yeah obviously. These are affordable , matte , and with all beautiful shades. That was all for this post ! I hope you all like it. Have you tried any Blue Heaven products yet ? If yes, comment down and let me know ! Previous Dot and Key Underarm Colour Correction Serum– Review. Next How to fix broken makeup without using rubbing alcohol.